composition:builder is a realtime graphics template editor for just:live and just:play and enables small and mid-sized TV stations to easily create and implement professional realtime graphic templates. 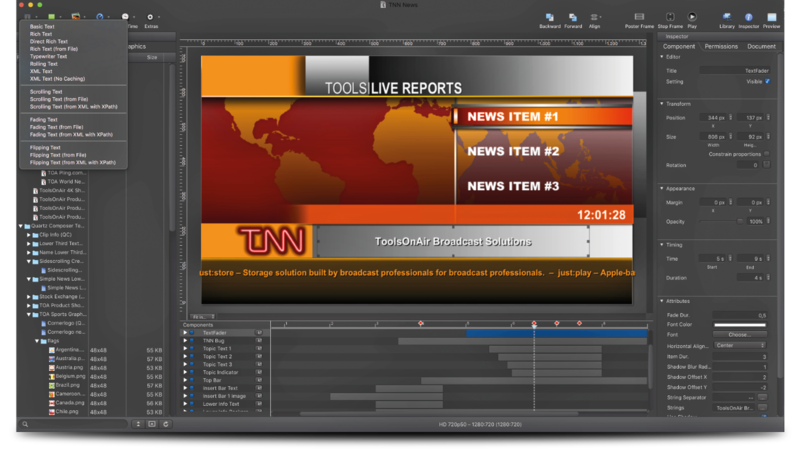 With its clean user interface and powerful feature set, composition:builder enables small and mid-sized TV stations to easily create and implement professional realtime graphic templates for news, weather, stock exchange, sports, and other broadcast applications. The graphic templates can be used within just:play and just:live. Professional quality graphics development no longer has to cost a fortune. Designers are able to create realtime graphic templates that can be easily customized at air time, maintaining pristine, professional quality graphics throughout the process. composition:builder templates can be updated manually and automatically in just:play and just:live. Out-of-the-box support for XML files, coupled with the powerful XPath query language enables data extraction from local or networked files, making the creation of live news tickers, weather, stock exchange, music channel inserts and traffic info graphics a simple task. composition:builder comes with a package of pre-designed templates which can be used and modified for free. Drop them into any graphics layer in just:play or just:live to play them out concurrently with any video clip. In addition the smart and yet powerful “stopframe” approach allows you to dynamically extend the duration of graphic templates, while maintaining the individual duration of animations within a template. Changes to graphics and information sources can be easily made during playout and brought to air in realtime – even with remote, web-based customized control interfaces which can be used with any web-browser (on desktop and mobile devices). composition:builder is designed to interface with Apple’s Quartz Composer technology, enabling you to create own custom components in Quartz Composer to extend your graphic templates. Based on Apple’s proven, robust OS X, composition:builder is a fully native Apple Xcode development, compatible with any current Apple Mac Pro and selected iMac and Mac mini models.